Happy July! You know what that means? The internet will drown in red, white, and blue foods for a week and Jason will sprain his side-eye before the holiday weekend at my obnoxious, overuse of the phrase “birthday month.” But it is my birthday month. But breakfast? TOTALLY DIFFERENT STORY. Fresh cherries (I think I only have 10 lbs left! 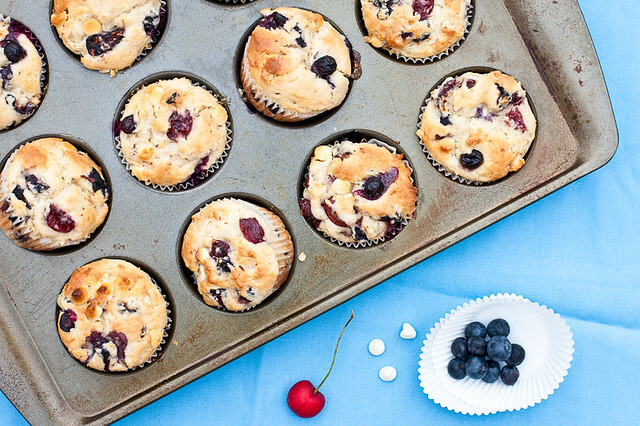 ), blueberries, white chocolate chips, and fragrant lemon zest are mixed up into my favorite muffin batter for one of those could-go-either-way dessert-breakfast hybrids. The base muffin recipe has been my favorite for years. The batter bakes up into beautiful domes and the addition of nonfat Greek yogurt keeps the muffin tender, moist for days, and lower in fat. So go bake these muffins and do something *truly* patriotic this weekend – like making hot dogs and setting off small explosives! 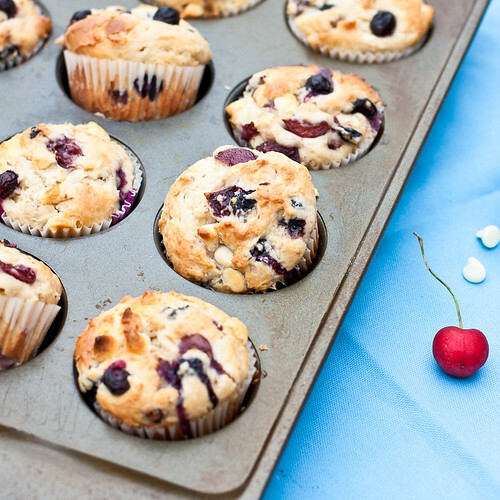 A tender, moist muffin bursting with fresh cherries, blueberries, and white chocolate. Mix flour, baking powder, baking soda, salt in medium bowl; set aside. Cream butter, sugar, and lemon zest on medium-high speed until light and fluffy, about 3 minutes. Add eggs, one at a time, beating well after each addition followed by the vanilla. Beat in half of dry ingredients, followed by a third of the yogurt. Add remaining dry ingredients in two batches, alternating with the yogurt, until incorporated. Toss cherries, blueberries, and white chocolate chips with the remaining 2 Tbsp flour and then add to the mixer, mixing for just a few more seconds to distribute evenly (the batter will be very, very thick). 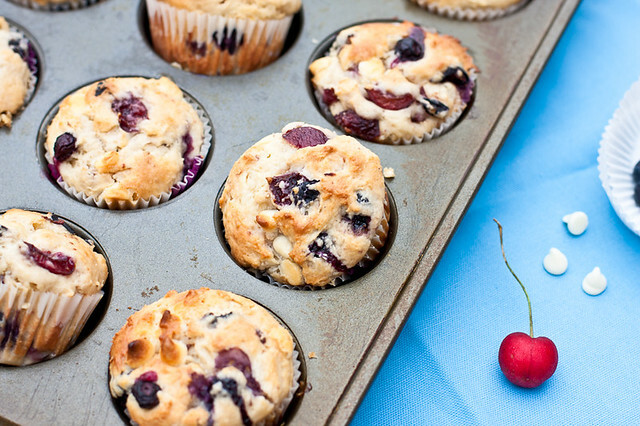 Spray a muffin tin with non-stick spray or line with paper liners. Divide the batter evenly among cups using a large cookie scoop (my scoop is ~2.25 inches across). Bake for 10 minutes and then decrease oven temperature to 375 and bake for ~10-12 more minutes until golden brown and a skewer inserted in the center comes out clean. Let cool 5 minutes in the pan before removing and cooling completely. Will keep ~4 days in a covered cake plate, can be frozen. 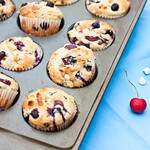 These muffins sound sooooo yummy!! Love, love, love the flavour! This would be a perfect thing for breakfast! These look great. And yes, “So PERFECT for your Fourth of July celebrations!” If only they were also #glutenfree, #raw, #vegan, #paleo, #twoingredients, and tasted like #cakebatter. But still, I’d eat one. These muffins are delicious! I love the combination of delicious cherries and blueberries with white chocolate. The yogurt really makes them light and moist. Thanks for another fabulous recipe! I feel prepared to make and eat these muffins for my country. And what a delicious patriotic duty it is! these look like a yummy breakfast!